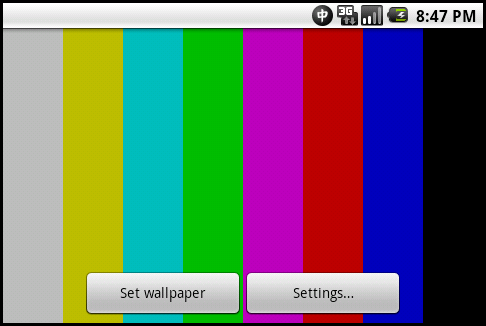 In this article, I show how to create a very simple live wallpaper. Mario Live Wallpaper - Awesome!!! 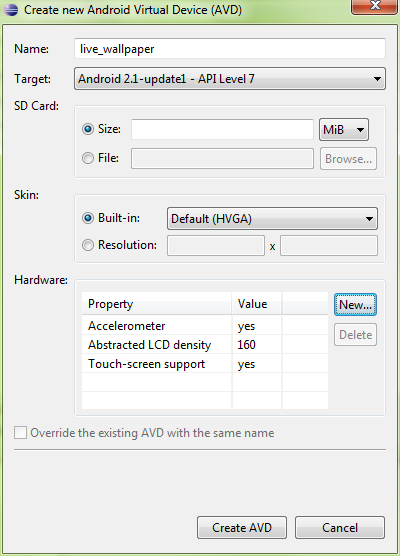 As I mentioned earlier, we have to create an appropriate Android Virtual Device (AVD) to run our application. 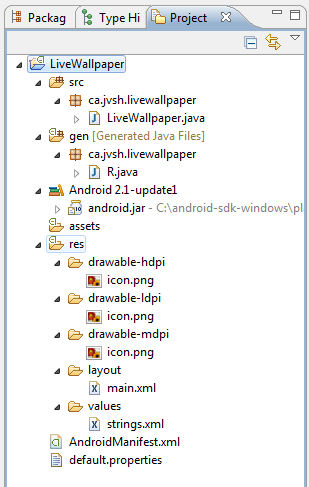 Open Android SDK and AVD manager. Resolution might be any. Our application will detect screen resolution and rescale graphic elements if necessary. I named the app as LiveWallpaper. 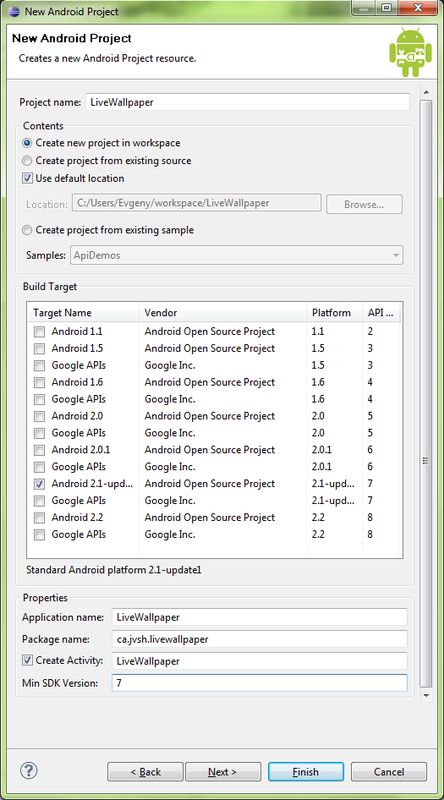 When creating Android project, set Build Target as Android 2.1. We have to change them slightly and add new files that would contain values for application's variables. First, delete layout folder and main.xml file in res directory. This file is used for creating layout for application controls which we won't use in our project. Instead of this, create folder xml where we will create two files livewallpaper.xml and livewallpaper_settings.xml that will contain values for live wallpaper service and settings dialog. Where wallpaper tag says that we are creating live wallpaper service. This file will be processed during apk filecreation. Where tag ListPreference shows that we provide user option to choose between several items and the tagCheckBoxPreference shows that we have check box (Yes/No) option. File strings.xml in values folder contains all strings values that we are using in our project. You can modify this file during localization of your software. Also in project, you will find testpattern.xml file. This file contains TV test patterns names and colors that they are using (TV test patterns mostly consist of rectangles). 3. Let's Explore the Code! You can check the code in the project file I've provided. I will just show the important points. How to detect screen size and orientation? You have to use DisplayMetrics class! How to draw a gradient? You should use GradientDrawable class! Those functions are called when we change our settings. In readColors() function, we are reading color values from resources (testpatterns.xml file). Proving a proper AndroidManifest.xml file is a crucial point if you want your app to be accepted at Android Market. It is very important to set up android:permission="android.permission.BIND_WALLPAPER" because this will allow the wallpaper to stay on your home screen. 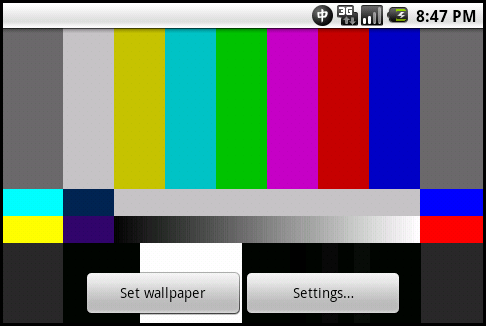 Android live wallpapers are supported only on Android 2.1. (API level 7) and higher versions of the platform. To ensure that your application can only be installed on devices that support live wallpapers, remember to add to the applications's manifest before publishing to Android Market which indicates to Android Market and the platform that your app requires Android 2.1 or higher. 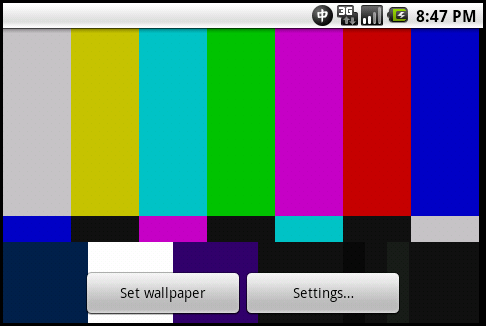 which tells Android Market that your application includes a live wallpaper.